An indulgent and delicious choc coconut feast! Beat the egg whites to form soft peaks, then gradually add sugar until well dissolved. Fold through the corn flour and malt vinegar. Grate the chocolate, and fold through egg mix with toasted coconut (leave quite streaky). Spoon mix onto a large (30cm x 30cm) tray lined with baking paper, and even out on top with a large metal spoon. Bake at 150°C for 70 minutes, then allow to cool in the oven. Make a rich chocolate ganache by melting the extra chocolate into the coconut cream, then allow to cool. To serve, puree half of the strawberries to a coulis. 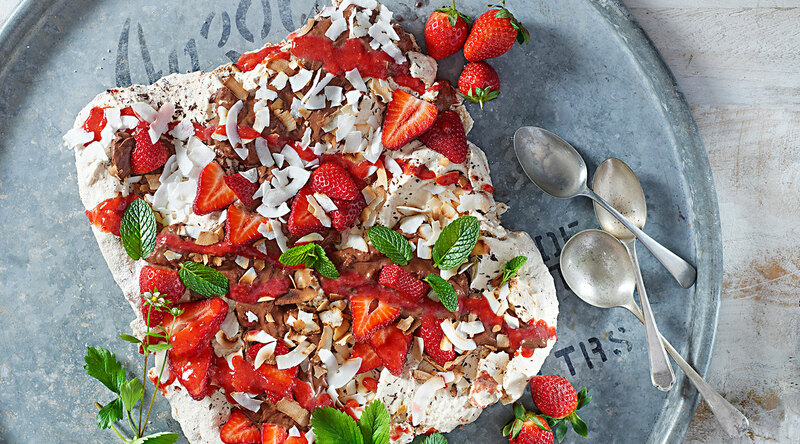 Serve pavlova topped with cooled choc coco ganache, additional sliced strawberries and extra coconut.